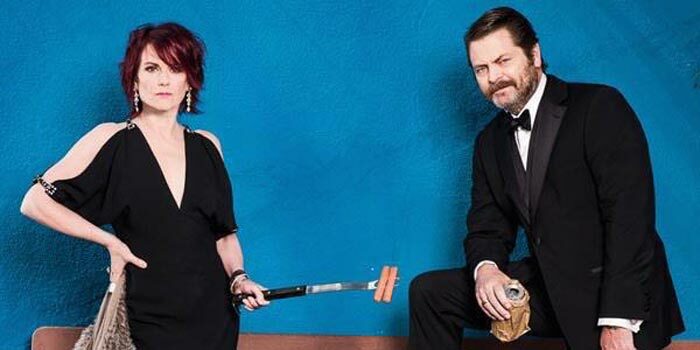 Looks like comedy couple Nick Offerman and Megan Mullally will be performing in Indianapolis after all. At the end of March, when Gov. Mike Pence brazenly signed the Religious Freedom Restoration Act – despite an outcry of opposition from all over the country – Offerman tweeted that the couple’s May 16 stop at the Old National Centre would be cancelled. Other acts, like rock band Wilco, would also cancel (or threaten to cancel) shows in the Hoosier state in response to RFRA. It would seem Offerman and Mullally were able to bury the hatchet with Indiana, or perhaps they were contractually obligated, either way, the performance in Indy is a go. According to a recent press release, Offerman and Mullally will perform as schedule. All proceeds from the performance will be donated to the Human Rights Campaign. The Summer of 69: No Apostrophe Tour features the hilarious couple turning their fiery union into something of a variety show. Using songs, stand-up, and some PDA, the couple pulls back the curtains on comic coupling – hilarity ensues. Each have been lauded for their craft. Mullally has for SAG awards and two Emmys, and Offerman has been given two Critics Choice awards. The two will take the stage at the Murat Theatre at the Old National Centre in Indianapolis at 7:30 p.m. Saturday, May 16. Tickets are $39.50. Visit www.oldnationalcentre.com for more information. For more information on The Human Rights Campaign (HRC) please visit www.hrc.org/.